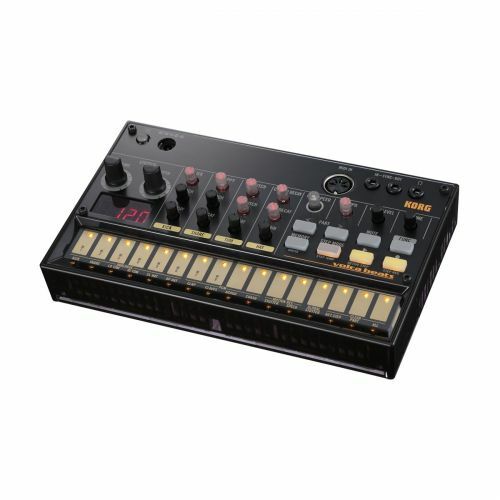 Volca Beats, Drum Machine from Korg in the Volca series. wavesic's review (This content has been automatically translated from French)" good bar but ...."
sounds suited my style, but a lack POTATO HUGE !!! must put the pots thoroughly on my table for it comes out !!! damage for analog! I use it only for 2 months soon. I on the other BAR digital and analog modélistaion that much better sound dynamic level! 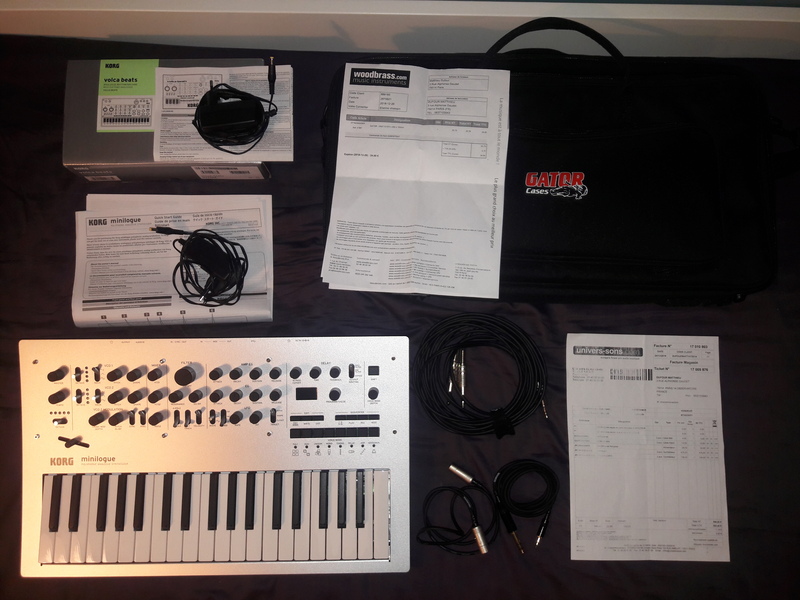 Brandski's review (This content has been automatically translated from French)" BAR friendly, mixed results"
1 audio output, 1 MIDI input. No effect if not stutter that may have applied to the parties. Very easy to use but suddenly we quickly made the rounds. The tempo in transmis tendency to décaller slightly. it is better to assign a tempo via MIDI IN. Some parameters are controllable via MIDI but would have had to push even the MIDI implementation work. The bass drum and toms are just génialaux. I took it just for that. As against the snare / clap are dirt zero. I wanted a small analog BAR to test mods on the circuit. And that's what needs to be done on it to use 100/100 and given him more punch (snare), as well as separate outputs. cf357's review (This content has been automatically translated from French)" Excellent mobile accessory"
o MIDI input, but not out! The use is top, very intuitive interface, and a few "hidden" features fully explained in the manual that extend a few more features (for example: press <Func> + <Power> start to change global settings). o Excellent sound overall, slap in the ears! o The bass drum is great, especially with the decay! o PCM sounds are really well chosen and playing with the PCM Speed ​​knob, it gets cool sounds! The Q / P is really excellent, definitely. 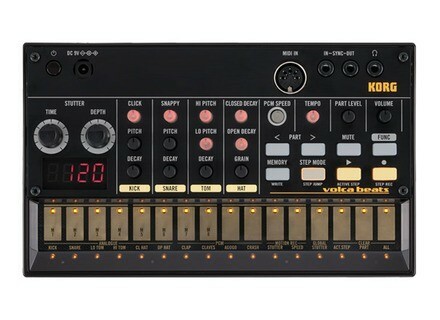 Remains to be seen as part of the offer because demands Volca Beats in his studio. I think the use companions to create rhythmic slightly anywhere / anytime, other than with an MPC-like. linn134's review (This content has been automatically translated from French)" Volca the Devil." 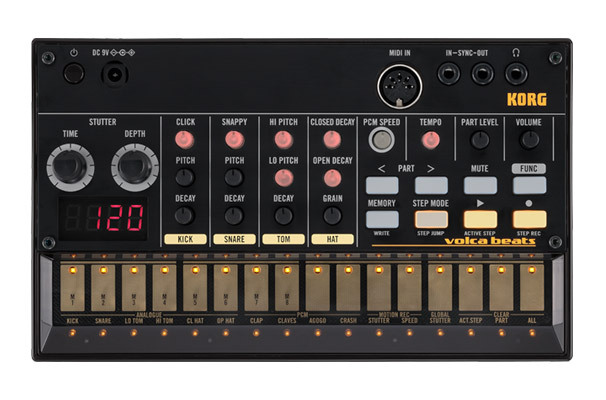 The Volca Beats is a small box mid-analog rhythms, mid-PCM, very simple and very compact. It's a little back to basics with a BAR that is to be nomadic, evidenced by the batteries and the small built-in speaker, but especially affordable. One effect, assignable to a source or all: the stutter, sort of contraption whose purpose is to produce repetitions. Battery, speaker, grafted and output sync (mini-jack), MIDI in and headphone / line mono. No separate outputs, a change is possible but risky. The sequencer allows 16 steps, real-time or "TR" edition. VB is simple, no submenu twenty pages, no twisted configuration. The manual is brief, it will be used to get an idea of ​​how the beast, but do not expect the moon. Editing is the same taste: easy. VB has a great sound in general, and more specifically a superb kick. The Snare is average but nowhere near as bad as some say, it's a matter of taste. For a more dynamic and broad Snare Drumulator I prefer the E-Mu, but again it's personal. Toms are really good (I like the little toms but usually those of the VB are great), the Hats are almost perfect. And PCM? Just the name is scary. Samples, yuck? Absolutely not, even if we are not in the top of the wig more better, PCM VB are really well chosen and not especially feel the "color" of digital samples, may be due to 10bits DACs very low-fi . I've had very little time, I enjoy a lot with. For the price it is essential to listen and test. If the sequencer is not that of a GPA, there is no reason to use VB as "sound module" driven by what you want. 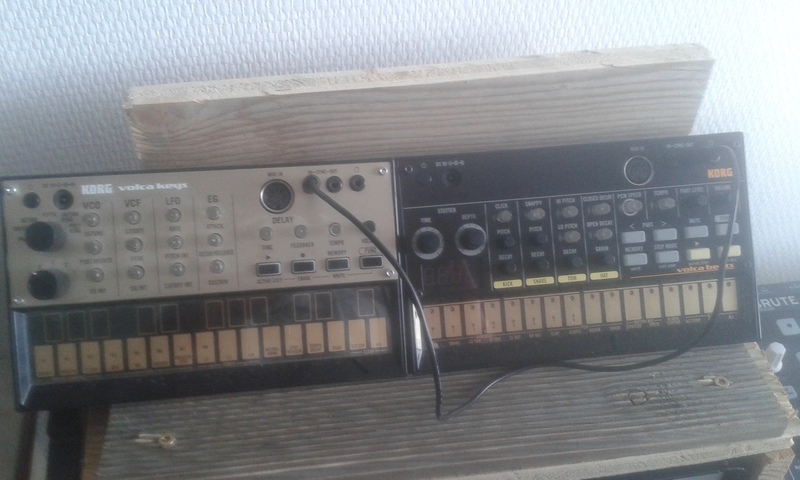 I have some strange boxes like this: TR707 (incredibly surcotée, but it is because of its simplicity and its separate outputs), DR110 (cheap, cheap, cheap), TR505, R8, DR550, RY30 .. .
BV is part of PT. Inevitably, next to a TR808 and a 909 it's poor, but in an already rich set there is nothing to be ashamed. Better than VB in the same price range? Future Wolf Akai maybe? Not with MFB anyway. I love this little BAR not pretentious. I have an idea to make a Vermona a few times, plus a MachineDrum, and that's for sure: I keep the VB. 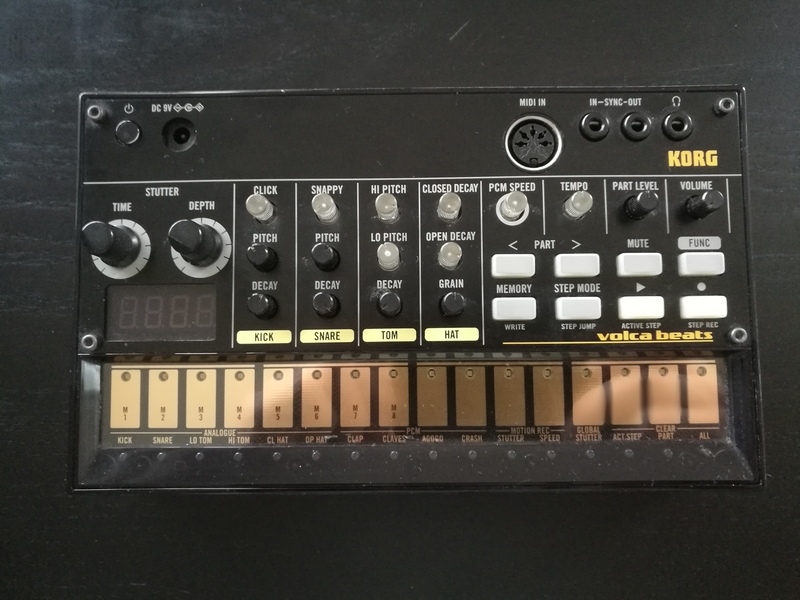 Amazing Machines offers Korg Volca users a mod that allows them to add a MIDI output to their synth and sampler.